Because of many recent dog food recalls and new veterinary recommendations, many dog owners have started making their dog's food at home. Many veterinarians believe that this is a healthier option, but it does require some research as not all dogs respond well to all diets. Before making a major change to your dog's diet, consult your veterinarian, particularly one well-versed in nutrition. Meat should make up at least half of your dog's diet*. This can take the form of raw or cooked meat, depending on your dog's diet. Poultry is often recommended because it is lower in fat than red meat or pork. Remove skin to reduce fat, and don't feed cooked bones. Raw meaty bones are a good choice, however, for providing nutrients and cleaning teeth. Include small quantities of organ meat in the diet, such as heart or liver, which provide nutrients muscle meats do not. You may serve meats raw or cooked as many studies have shown no difference in nutrients or digestibility between the two. However, some dogs cannot tolerate raw diets, so consult your veterinarian if you have concerns. Dogs also can eat fish, though you should not serve it raw. Eggs** are also an excellent protein source and can be served raw though your dog may prefer them cooked. Some dogs have allergies to certain meats, so the protein you choose will depend on your dog. Fruits and vegetables are not a large part of a wild canid diet, but they can provide fiber and antioxidants. Some good vegetables include spinach, squash, broccoli, cauliflower and carrots as well as others. Bananas, apples, berries and melon are good fruit choices. Cook and grind vegetables in a food processor to ease digestion. Avoid grapes and raisins, which can cause kidney failure in dogs. The decision to go grain-free creates a lot of controversy when discussing pet diets. However, some dogs can tolerate grains, and they can make the diets more filling for a lower price. Potatoes and sweet potatoes can be healthy grains as well as brown rice, barley and quinoa. Be sure to cook grains for digestibility. If you don't feed fish, you will need to supplement some type of fish or cod oil for additional vitamins, such as vitamin D. Cottage cheese, yogurt and ground up egg shells can add calcium to your dog's diet, and many diets need to be supplemented with vitamin E as well. Most dogs don't need to be enticed to eat, but if you would like to add spices to your pet's food, you can add spices such as turmeric, rosemary and parsley. Avoid garlic, which can be harmful to pets. 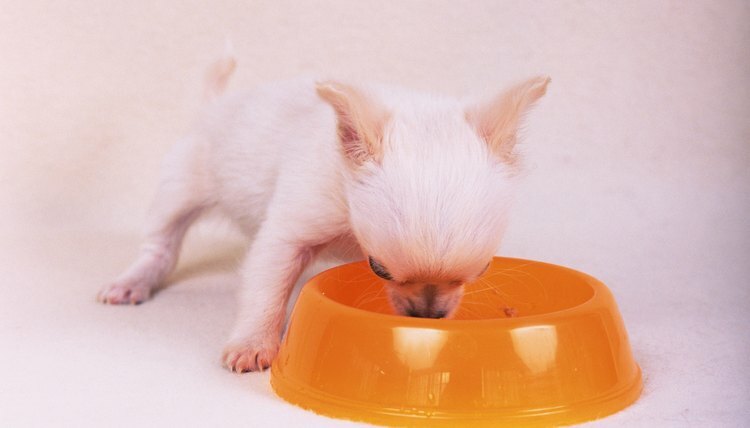 How much to feed your dog will depend on your dog's age, weight and activity level. Puppies and active dogs generally require many more calories as they are growing and burning calories more quickly. Consult your veterinarian or nutritionist for the recommended amount for your dog. Online calculators are available to help you decide. No matter what the recommendation, watch your dog's weight for the first couple of months after changing the diet. If it goes up or down, adjust accordingly.